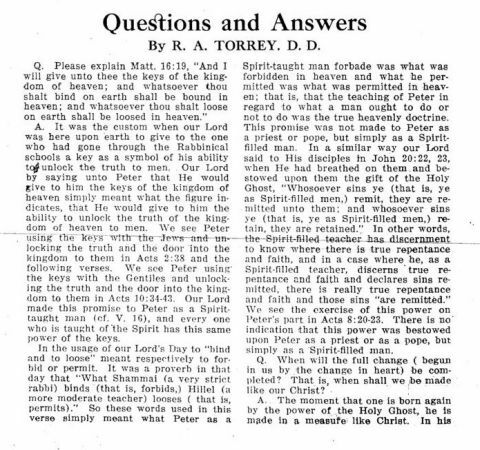 A: It was the custom when our Lord was here upon earth to give to the one who had gone through the Rabbinical schools a key as a symbol of his ability to unlock the truth to men. Our Lord by saying unto Peter that He would give to him the keys of the kingdom of heaven simply meant what the figure indicates, that He would give to him the ability to unlock the truth of the kingdom of heaven to men. We see Peter using the keys with the Jews and unlocking the truth and the door into the kingdom to them in Acts 2:38 and the following verses. We see Peter using the keys with the Gentiles and unlocking the truth and the door into the kingdom to them in Acts 10:34-43. Our Lord made the promise to Peter as a Spirit taught man (cf. V. 16), and every one who is taught of the Spirit has this same power of the keys. In the usage of our Lord’s Day to “bind and to loose” meant respectively to forbid or permit. It was a proverb in that day that “What Shammai (a very strict rabbi) binds (that is, forbids,) Hillel (a more moderate teacher) looses (that is, permits).” So these words used in this verse simply meant what Peter as a Spirit-taught man forbade was what was forbidden in heaven and what he permitted was what was permitted in heaven; that is, that the teaching of Peter in regard to what a man ought to do or not to do was the true heavenly doctrine. This promise was not made to Peter as a priest or pope, but simply as a Spirit-filled man. In a similar way our Lord said to His disciples in John 20:22, 23, when He had breathed on them and bestowed upon them the gift of the Holy Ghost, “Whosoever sins ye (that is, ye as Spirit-filled men,) remit, they are remitted unto them; and whosoever sins ye (that is, ye as Spirit-filled men,) retain, they are retained.” In other words, the Spirit-filled teacher has discernment to know where there is true repentance and faith, and in a case where he, as a Spirit-filled teacher, discerns true repentance and faith and declares sins remitted, there is really true repentance and faith and those sins “are remitted.” We see the exercise of this power on Peter’s part in Acts 8:20-23. There is no indication that this power was bestowed upon Peter as a priest or as a pope, but simply as a Spirit-filled man. First published in The King’s Business, January 1913, p. 38.